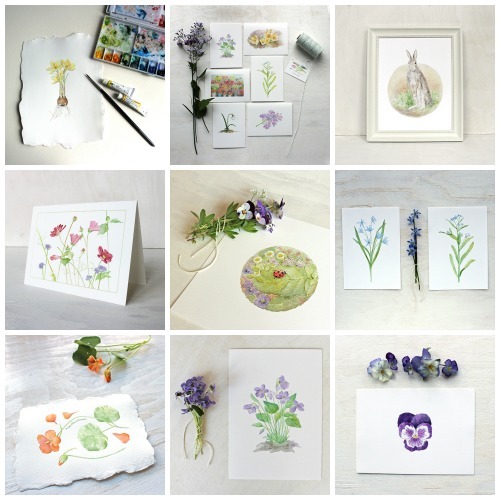 Just a short post to let you know that it is the final hours of my 20% discount in my Big Cartel shop. Use the coupon 1000REASONS at checkout. The coupon expires at midnight EST tonight (May 31st). 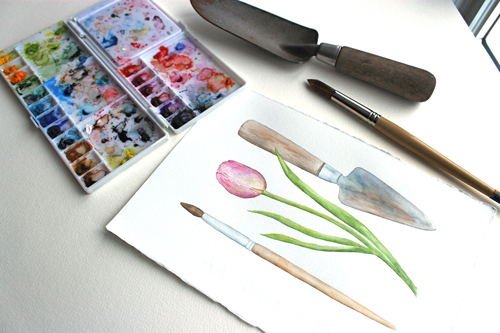 I have definitely been holding a 'trowel' more than a 'paintbrush' these past few days. My garden is big and I'm the head gardener. Thank goodness, I have help...ummmm well, company at least. 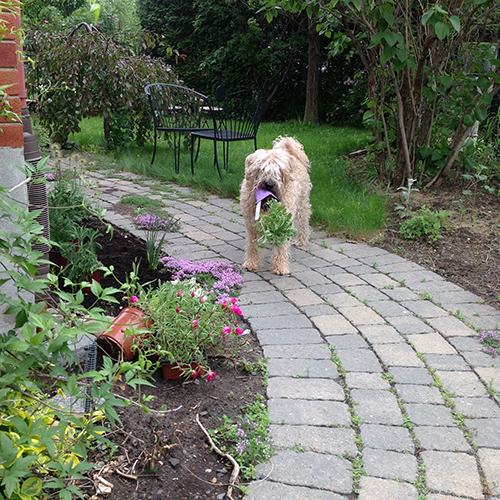 Meeko took off with a whole pot of mint while I was planting herbs this morning. I love so many flowers but I have a real soft spot for blue flowers. I also love tiny things. My mother says that when I was a baby I used to ignore toys and become completely enraptured with a tiny speck of something. My eye for detail and appreciation of small things have apparently been with me for a very long time! 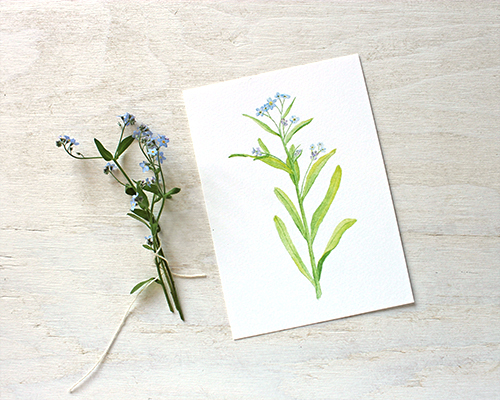 Forget-me-nots fulfill so many loves. The photo of Meeko above was taken at the edge of a park near us. There is a house that backs onto the park in that spot. 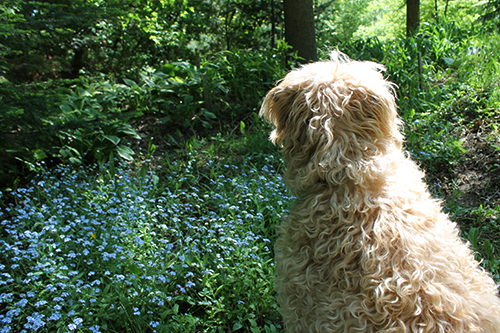 Their entire backyard is covered with forget-me-nots! They spill into the park beside. It is the most exquisite sight--like a soft blue cloud. Meeko sat beside me while I took photos. He's so patient when I use my camera although that rightward turn of his head suggests that he is most likely thinking of the squirrels he often sees in the park a bit beyond. 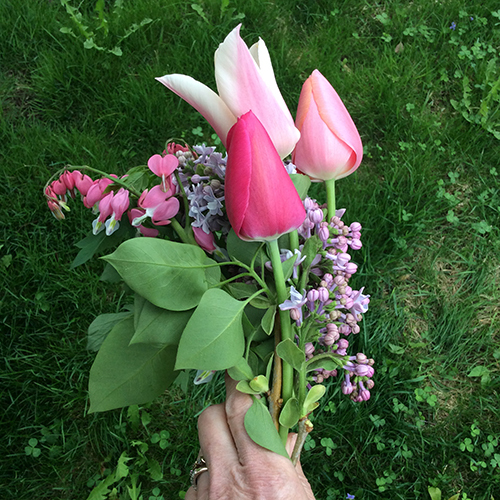 I don't pick bouquets in the big patch of forget-me-nots in the top photo. It feels too much like it's part of a private garden even though it's in a public park. 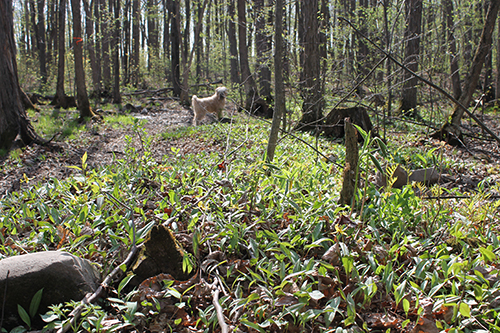 There is a patch of forget-me-nots beside one of the little paths I walk with Meeko. That's where I pick small bouquets. The houses are far away so I don't feel that I'm depriving anyone by picking a few stems. 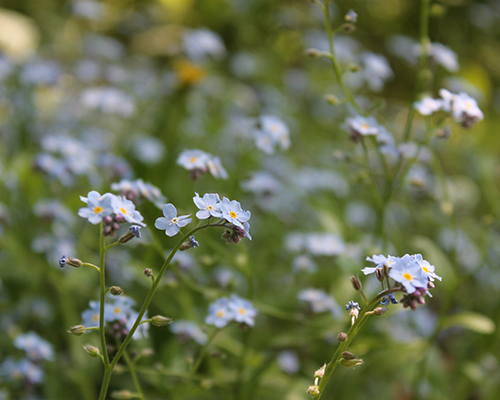 I also have forget-me-nots in my garden but they are in a very shady spot and haven't bloomed yet although they have buds. Something to look forward to. 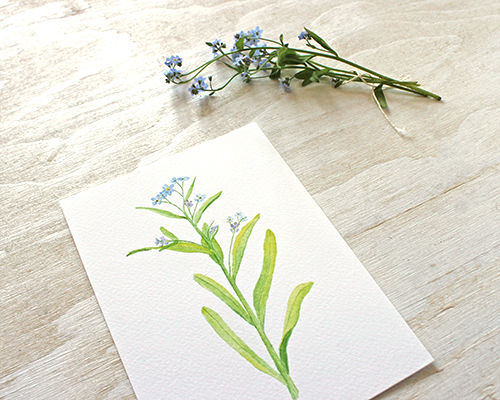 Having fresh forget-me-nots was the perfect reason to retake photos of my forget-me-not print. I am trying whenever possible to incorporate the actual subject of my paintings with my photos. That is not very easily done during our winter months so I have to hurry while things are still in bloom! 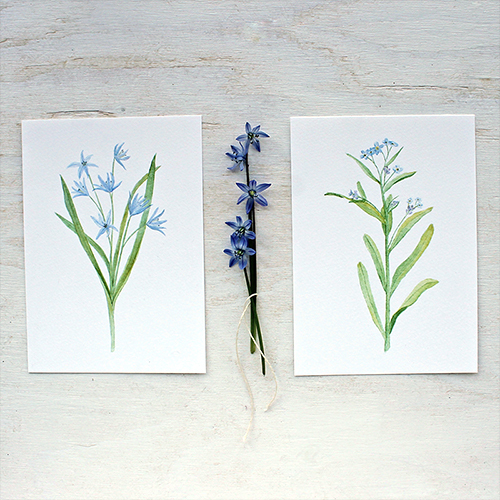 I also recently completed a painting of blue scilla that makes the perfect companion to my forget-my-not print--two beautiful blue spring flowers. 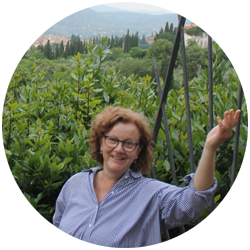 If you haven't looked at my new website, I hope you'll have a peek. I have added many new items over the past few weeks. 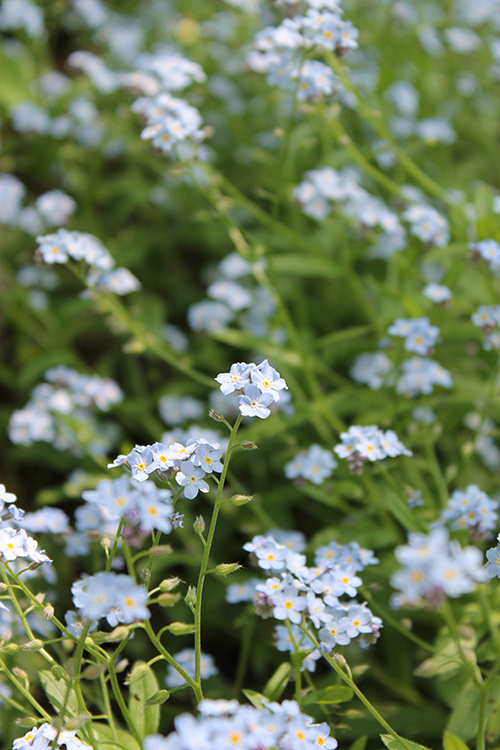 Henry David Thoreau wrote of forget-me-nots, "It is one of the most interesting minute flowers. It is the more beautiful for being small and unpretending; even flowers must be modest." I love that. I love them. 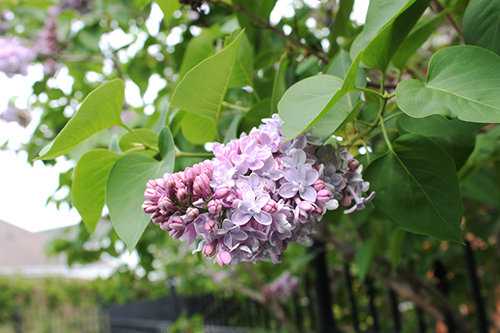 It's that beautiful time of year when the air is heavy with the sweet fragrance of lilacs. 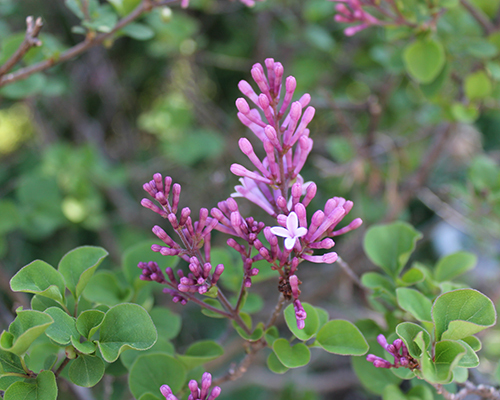 I have four common lilac shrubs (Syringa vulgaris). They are planted around the corner of our house where there are no windows. Their tantalizing scent draws us out of the house and around the corner to visit them. I bury my nose in in the blossoms whenever I pass by. 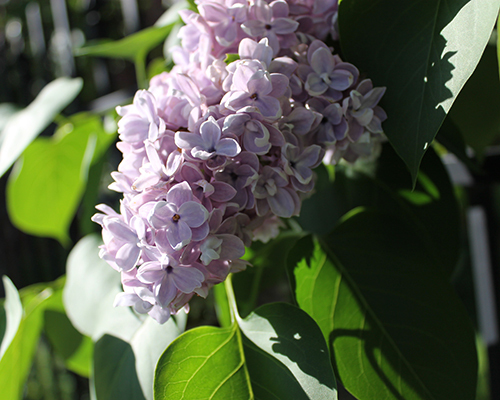 I am sensitive to many fragrances but I have no trouble at all with the scent of lilacs. Thankfully. I did the watercolour painting below in 2012. I think it's one of the originals that I will always hang onto. I offer both prints and cards with this image and they continue to be among my most popular products. 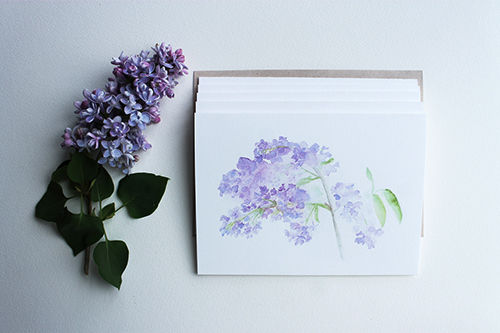 I often use my Lilacs image on the little thank you cards that I include with orders. Maybe you've received one from me. My dwarf Palibin lilac is gearing up to bloom just as the others fade. 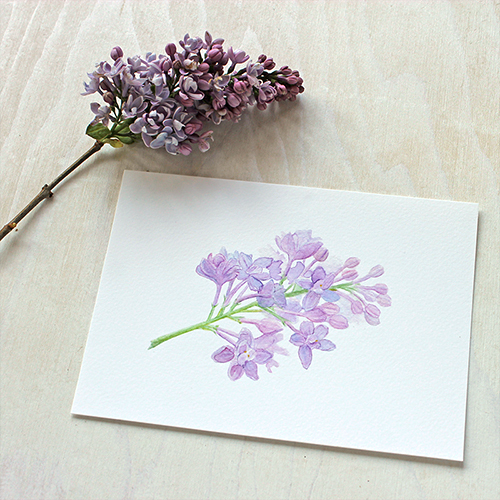 I did my 'Lilac Sprig' watercolour in 2013. That original has sold but I offer the image as a print and note cards. 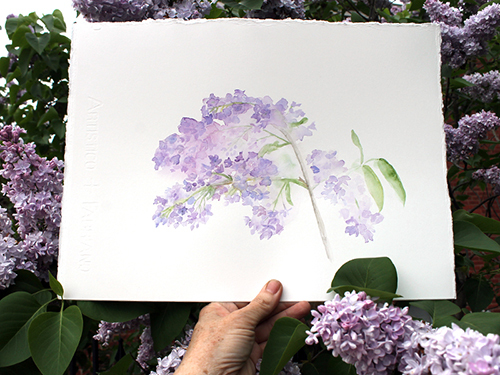 I took advantage of the lilacs being in bloom to take this new photo on my 'Lilac Sprig' print this past week. It's a sweet 5" x 7" print that looks very pretty framed. I don't cut lilacs often for bouquets. I find that they don't last very long in a vase. I couldn't resist cutting a few though recently and they were drooping by the next day. Does anyone have a trick for making cut lilacs last? I would love to hear it! And to close, a little music sung by Jeff Buckley. 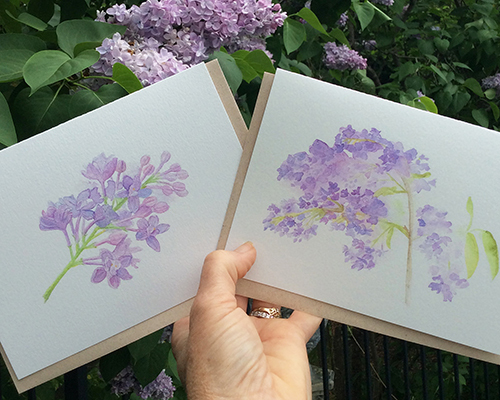 Because lilacs! 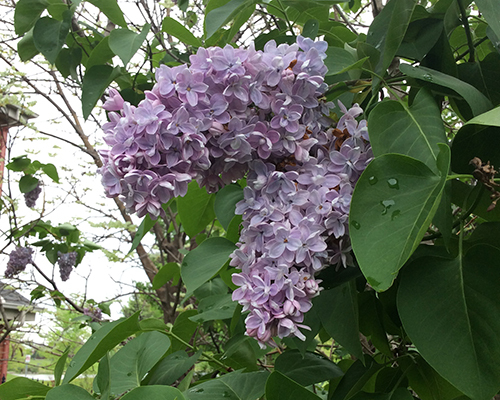 Update: My friend, Margie, of Resurrection Fern has given me a tip for making cut lilacs last longer. She suggests smashing the woody stems with a mallet or meat tenderizer. I will give this a try! Meeko and I went for a walk in the woods near our house this morning. These are the same snow-covered woods that you have seen in my blog countless times. 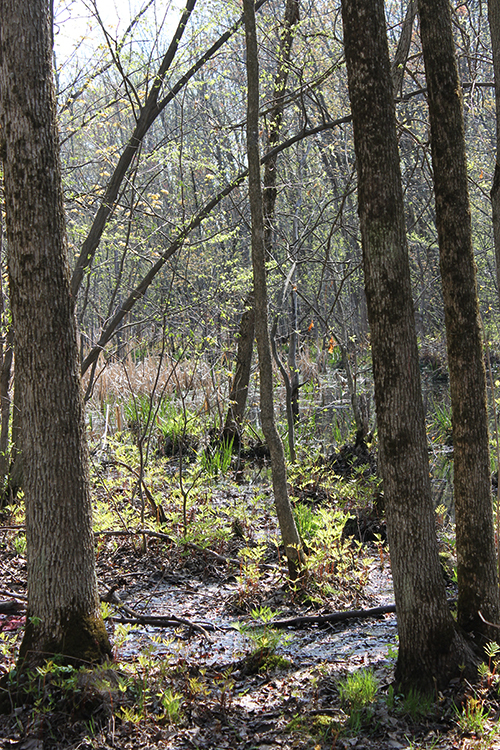 In the spring and summer, it is usually too boggy to walk there. We have had such warm and dry weather the past few days that the pathway was completely accessible. Well actually, it was a little squishy in places but walkable if you stepped carefully. I let Meeko lead the way. 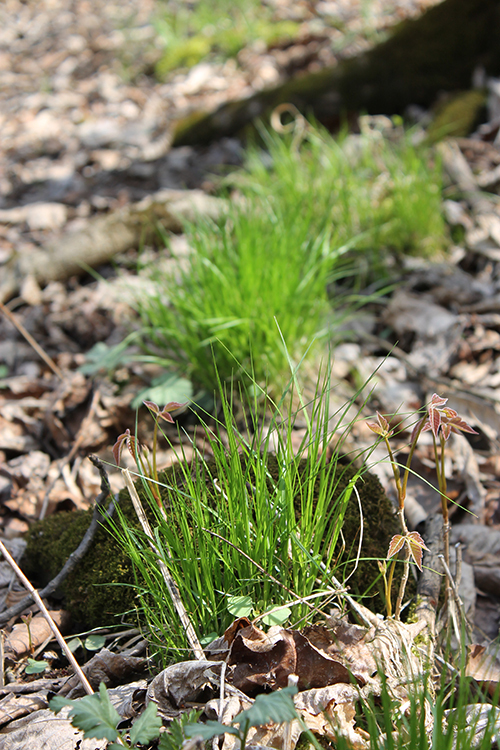 What a treat to see the spring version of these woods and all of the lovely plant life there. 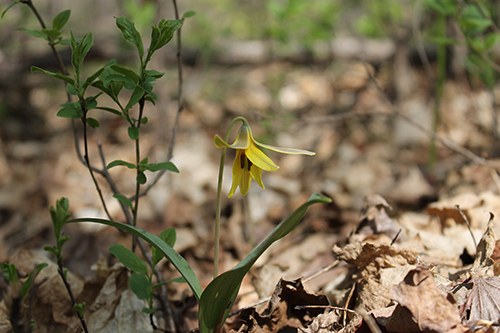 There were trout lilies everywhere. Such elegant little flowers. 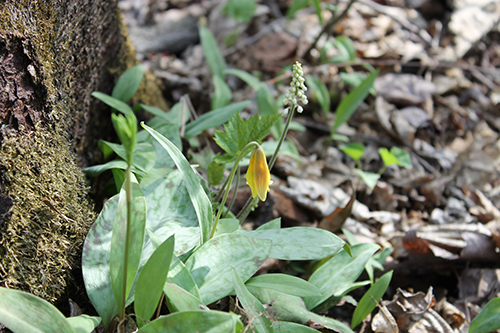 I also saw these delicate white flowers. 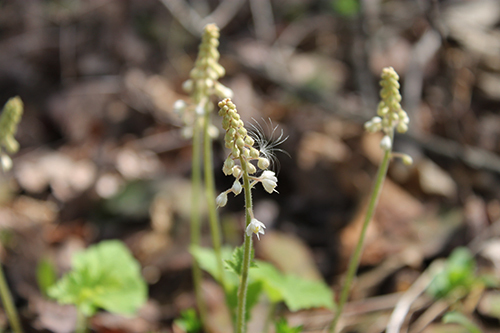 I think they are some type of heuchera. I love the little bit of fluff attached to its side. I exclaimed out loud when I saw the next flowers! Meeko looked around as he thought that such an excited voice must mean a squirrel or other small creature. Nope. Not a four-legged creature. 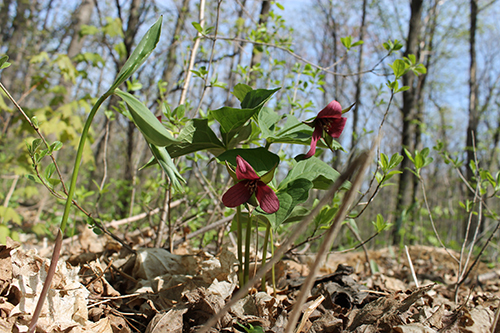 What I had seen was a trillium! I put my head right down on the ground to take this photo. Then I had to pick the leaves out of my hair afterwards! Completely worth it. What a beautiful flower. 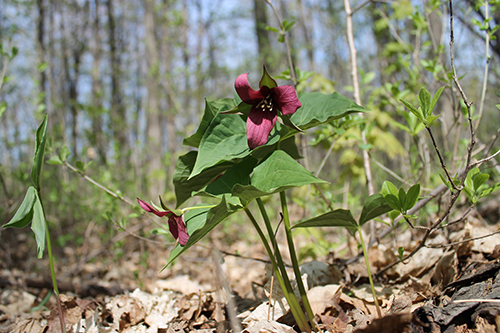 I've seen trilliums often where my parents live in Northern Ontario. I didn't know that there were some within walking distance of my home! So exciting. Everything looked beautiful in the morning light. 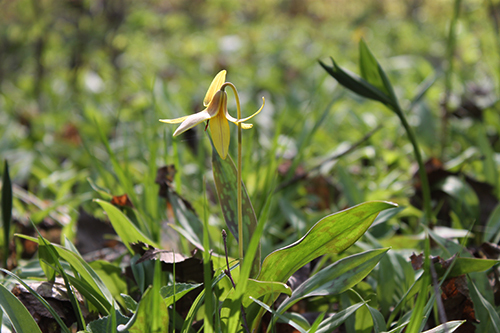 I loved the curved pattern of these little tufts of grass and the lovely pairing of this trout lily and the heuchera. What a beautiful way to start a morning. I haven't stopped smiling since.